What happened to Jason and Leo?. ROFL. HD Wallpaper and background images in the The Heroes of Olympus club tagged: the heroes of olympus the lost hero heroes piper jason new character. 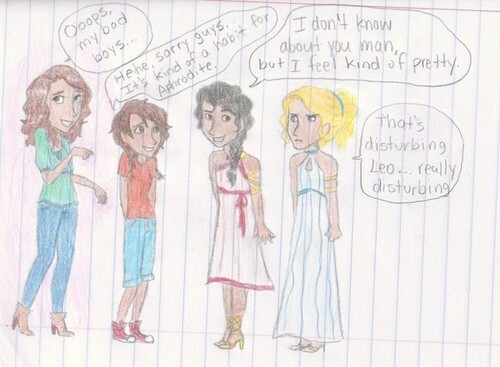 OMGS THAT IS LEO AND JASON AS GIRLS!!!!!!!! CREEPY!!!!!!!!!! 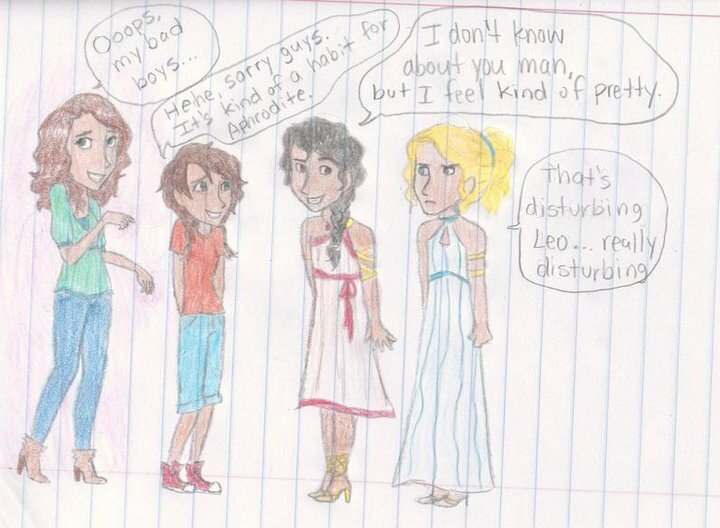 LEO IS FUNNY AND I THINK JASON LOOKS LIKE ANNABETH OR AT LEST THE WAY I IMAGINE HER!!!!!!! thats really funny! i wish i could draw like that. my room wall is covered with Percy stuff... little obsessive..heehee. hahahahahah they are very pretty. I luv Leo, he feels pretty!?!?!?!?!?!? Ha!Jason looks like a girly Annabeth. He talks like her to. Rofl rofl 'leo feels pretty'. I am seriously rofling, if rolling on a bed counts. hahahahahahahaha!!! i know right? jason looks too... annabethy! but so super duper ooper shmooper dooper funny! OMG LEO!!!!!!! HAHAHAHAHAHAHAHAHAHAHAHAHHA!!!!!!!!! LOVE THIS PIC!!!! !